Though I had made some prior to this weekend, most were done yesterday and today. My mom and I had a piecing day, making over 50 yesterday. Another 25 or so were made today. 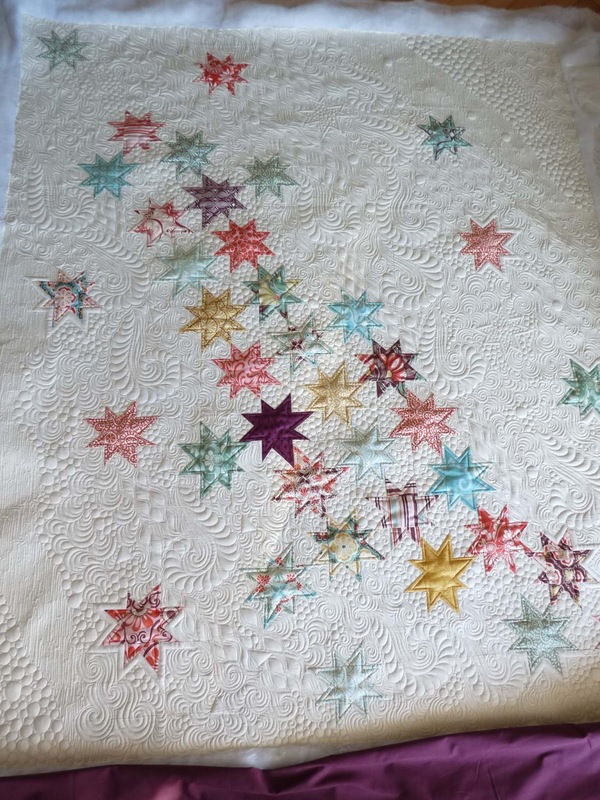 They are asking for two specific patterns to be brought to the banquet...the star shown below, and the square on point. Although they have stated that these can be either red, white and blue OR brightly colored, I am doing all patriotic. I didn't have a ton of red and blue fabrics in my stash to begin with, but made it my goal to use what I had rather than purchase any fabrics. I rarely use reds and blues too since they just are not my colors of choice. I am kind of surprised how far my scraps have gone! I am equally surprised how many scraps I am generating that are great scraps, just not large enough to use for another block. I quilted this up a couple weeks ago. It's only 48" square, so it comes together reasonably fast. OK, like in about 5 hours (saying that makes me sound slow!). The client is using it for a table topper. 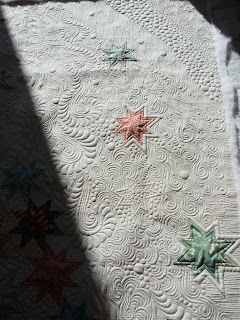 The block centers were fussy cut from a vintage sheet. 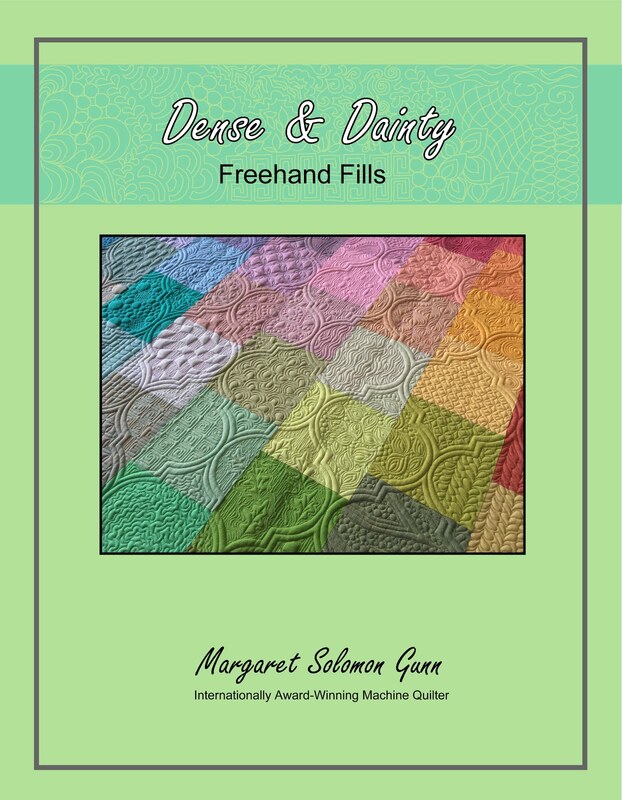 To help the quilt lay flatter, I ditched all seams on the blocks with Monolon. This is a little time consuming, but is really worth it in keeping the piecing looking crisp. 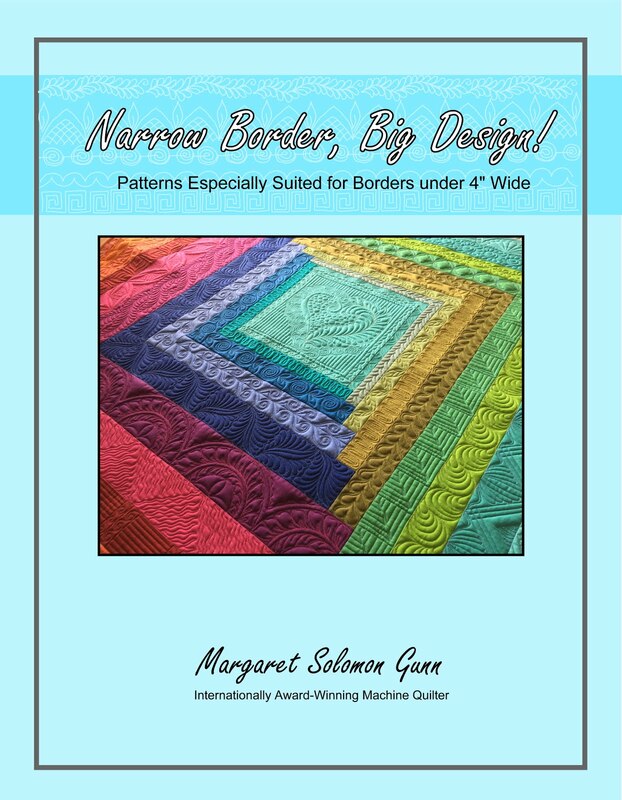 This is a step never to be neglected if you are having a quilt custom quilted. It is truly the finishing touch. I tried to keep the quilting somewhat simple and traditional, in keeping with the style of the quilt. It just was not screaming for pebbles or dense fills. The beadboard and egg-dart treatments are just right for traditional pieces. And of course, so are the feathers, which she requested. Although it does not show, everything but the feathers is stitched in a mustard colored Omni thread. I like Omni because it runs well in my machine, and because it is a matte finish, and resembles cotton threads. Personally, I hate to actually stitch with the cottons. They break too easily and are way too linty. But certain quilts just call for the soft, non-shiny look. I have just worked since 6:30 this morning on just about everything I have going. I finished a 104" Amazon Star. Boy, am I glad to see that one off the frame. It's been there about 9 days on account of school vacation and snow days. You might wonder how I can be so productive (or not...)...I have deposited all 3 kids off with Nana for 2 days. Got to go out to eat last night and not worry that they have burgers on the menu. It's actually nice to have an adult conversation and not always watch what the kids are getting into (sugar packets, salt, vinegar, you name it!). 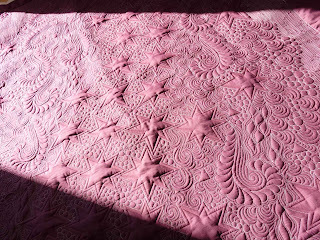 After finishing the Amazon Star, I played with my silk quilt for a couple hours. I have run out of the interfacing, but am down to finishing the last corners. Then just a little bit of applique. I even made one QOV block to test the no-waste flying geese method before I pitch it to my mom. She and I have a Saturday sewing date to make QOV blocks. I have made a few already, and cut out 25 yesterday. I'm trying to get rid of red and blue fabrics from my stash - they are by far my least favorite, and I don't miss them one bit! Hope your week is as snow-free and productive. 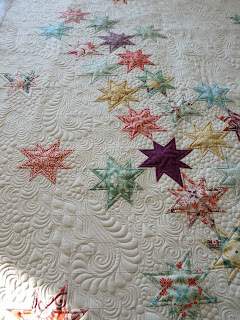 Through the quilting texture, I have attempted to create flow and movement, as though these stars are really falling. The client wanted me to limit the feathers, and use lots of bubbles. 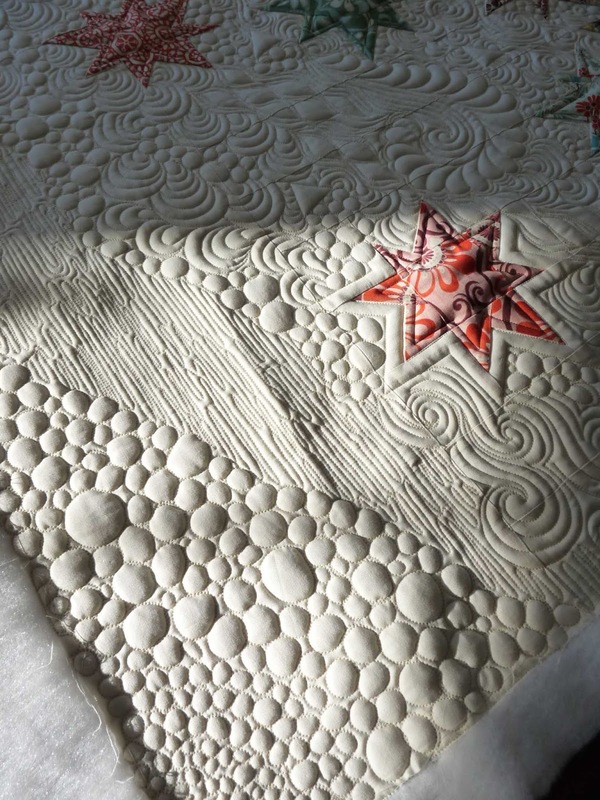 You know I hate to have the plug pulled on feathering because it moves a quilt so nicely. I tried...there are some large feathers with swirls. I did a relatively minimal treatment to the stars. They are ditched and outlined again. A few are outlined or partially outlined in the white to show them off. I tried not to outline the entire star or all of the stars because that would be predictable. This type of quilt is about being whimsical, in the moment, seemingly unplanned (if there is such a thing for me!). There's a largish flow of bubbles down through the stars, and sections of swirls, curls, and "pods" as I call them. 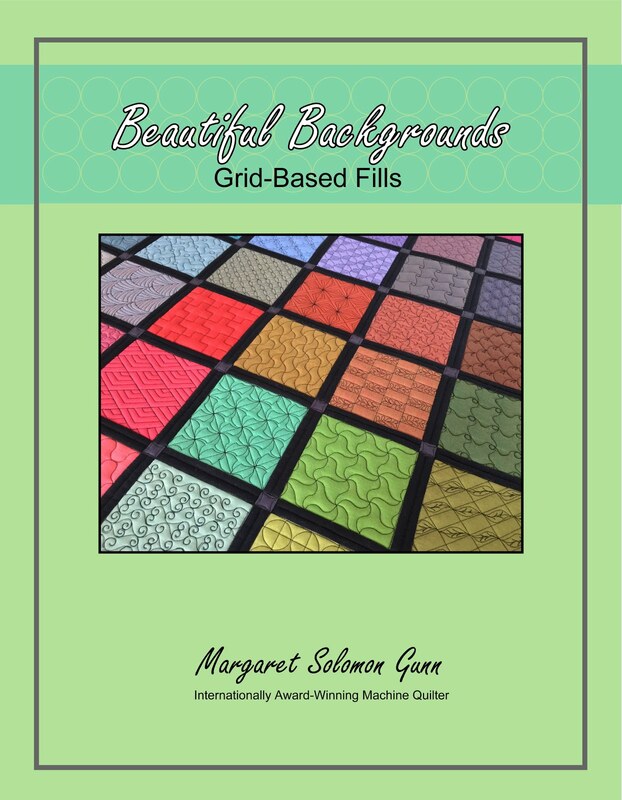 I had to refer to my Sea Glass quilt a bunch of times for motivation and ideas. It is much the same concept, and although I initially had trouble "letting go" of form & function and planning on Sea Glass, it all seemed to flow when I did. Interspersed in the flow on the left side every so often are triangles. I did the same thing on the other side, except I used 1" circles. These are done with the template so they are all the same. I love how the thick bunches of pebbles show with the changes of texture. The back is one of those that sends fear into the longarmer...a solid contrasting color (knowing the bobbin thread would be white!) - not my favorite look, but it's modern and it's the client's choice. This was a rush job. It's going to hang in some show in TX in 2 weeks. 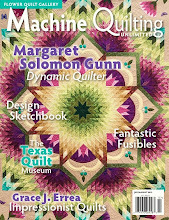 I suspect it's a modern quilt display for the Texas Quilt Show, but I'm not positive about that. I will have to wait until the summer. 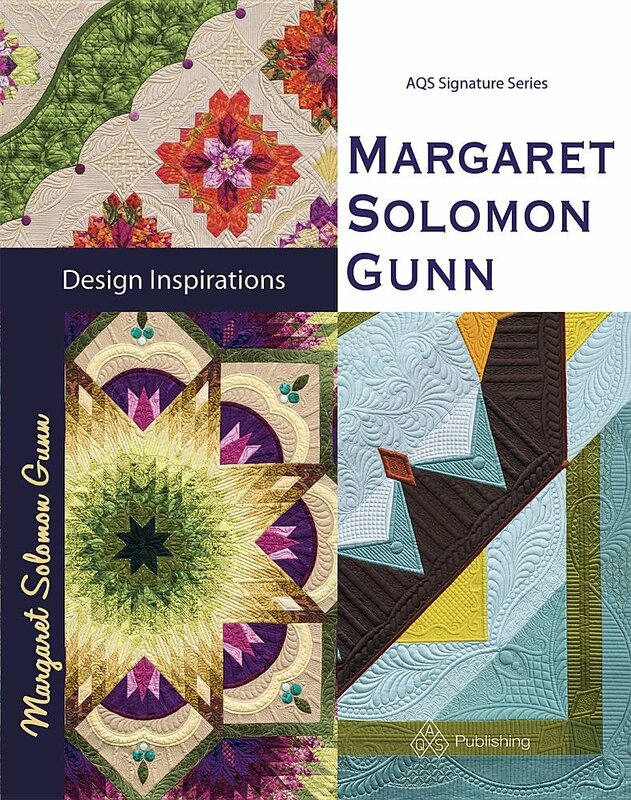 I believe that she will have it in a display of quilts that the Boston Modern Quilt Guild is displaying at a side venue to the Lowell Quilt Show. I haven't yet heard from the owner of the quilt, but another member of the BMQG who saw it yesterday has already emailed me about quilting for her after seeing this. That's success in my book! One of my many California clients will be receiving two of her baby quilts in a couple days. I quilted these a week or more ago. 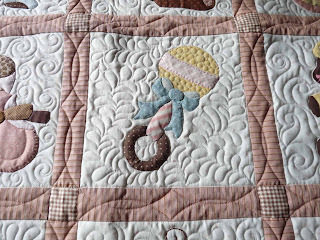 This one is a very cute applique pattern, with all sorts of fun baby items. It will be a quilt the recipient will use so I didn't over quilt it to make it stiff. She will be attaching a scalloped binding. 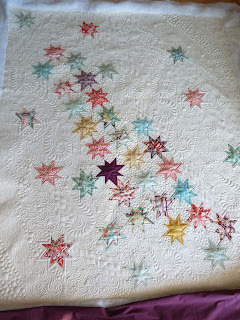 I love to do an interesting treatment to sashings to find that it gives the entire quilt a new look. Egg & darts are simple, requiring just a little marking and a circle template. I kept the quilting on the appliques very basic, just outlining the basic shapes, and only quilting on the appliques when really necessary. Two simple fillers were alternated on all 12 blocks -- swirls and loose feathers. It's a delicate look perfect for a baby girl. 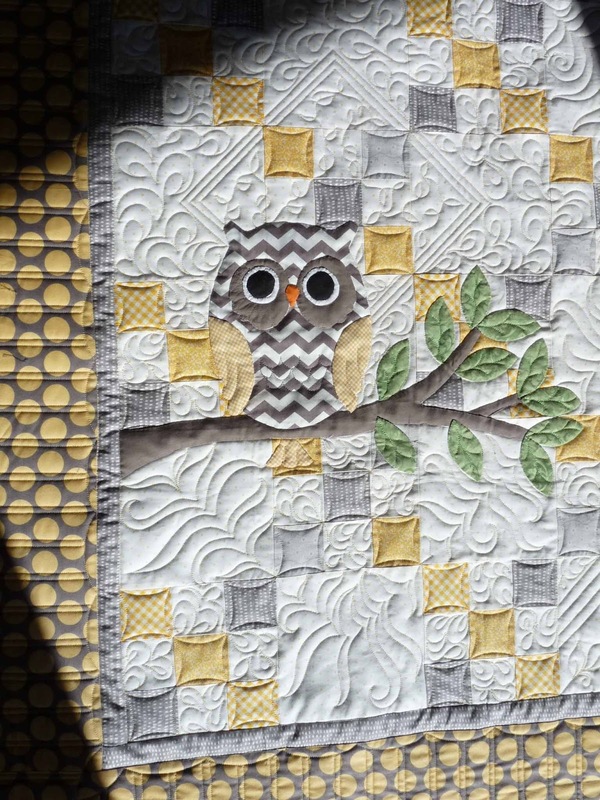 There is another baby girl expected too...and she's getting an owl quilt. 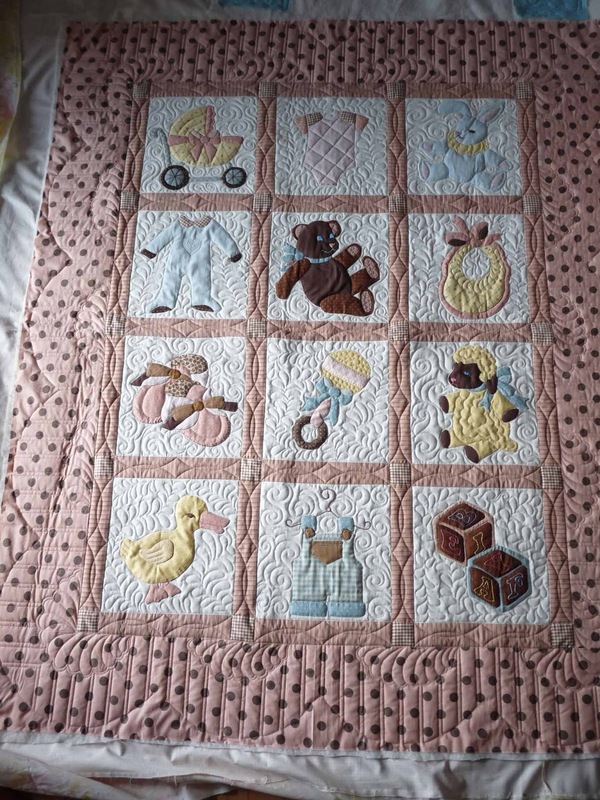 I quilted this one for a different client back in the late spring. 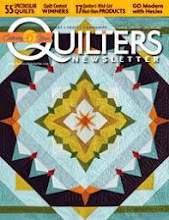 Fortunate for me (since this was a rush job), I didn't have to design quilting for it. 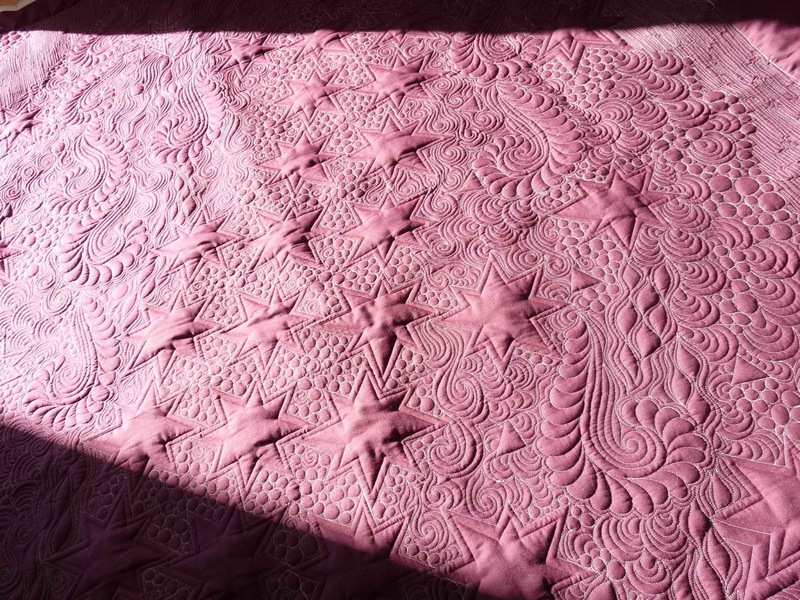 More or less, I used the same layout I did previously, minus the pebbling which I thought might make a stiffer quilt. This one is going to be used also, whereas the first one I did was a display. The owl and applique are very cute -- just a little simple quilting to accentuate the wings and leaves. The rest is just outlining. I have an absolute ton of things going on right now, and a week of school vacation is only a week away. Guess you know who's going to be ultra productive this week, huh?! This week has been a blur. And because we are expecting what forecasters are calling the "storm of the century", it's likely that kids will be home tomorrow, and quilting will have to wait until Monday. Last weekend, was much slower paced. I started on a client quilt, but had most of the days to putter on my own silk quilt. I am nearing having the top finished (haven't in all honesty touched it since last Friday though! ), so I started pondering how it might be quilted. I like this part of the process. It's creative. There is no picking out of stitches, and I just cannot do wrong. 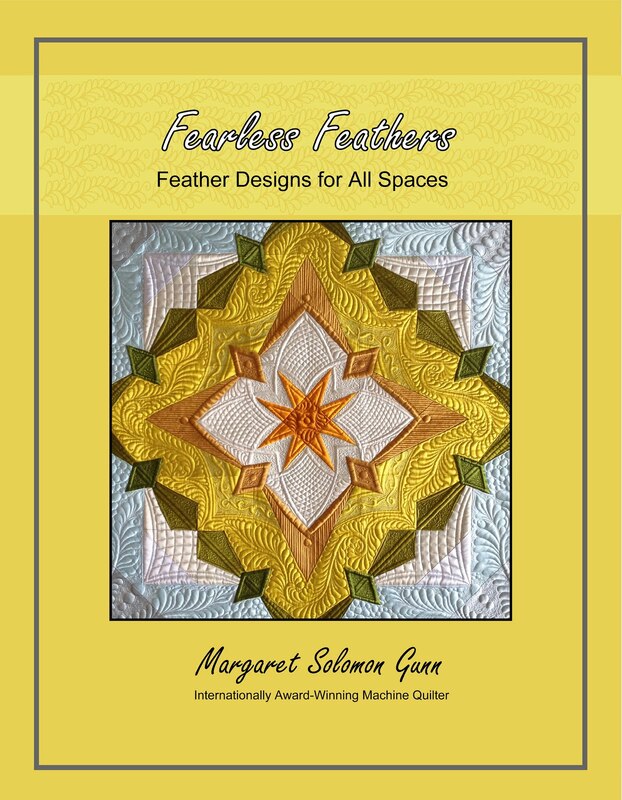 I think that this will be a fun quilt to quilt...lots of feathers. 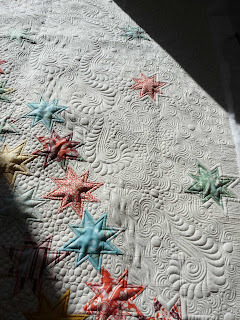 I am taking my new quilt "Big Bertha" to a photo shoot next weekend. Setting that date put the pressure on me to actually get it finished! I have been hand appliquing a bias stripe around the quilt (yup, about 330" of bias) on the backside. This has been going on for about 2 weeks. Its nice to have an unexpected feature on the backside since many shows do hang them where the backs are visible. Besides, it will eventually go on my bed, and it will be seen there. Right now, the quilt is soaked and pinned to the blocking boards. Except for drying and then stitching on that 99"wide sleeve, it is done. Today is a Friday that just doesn't feel like Friday at all. My kids had a 1/2 day yesterday and no school today -- something I don't look forward to ever. It's hard enough keeping up with the demands of a business when you work from home and they go to school 5 days a week. Since Thanksgiving, however, I think there has only been one 5 day week. They have had a couple half days for snow, a few holidays, and a couple of "teacher workdays". Come on, teachers...do you really work on these??! Yesterday after they got home, my boys took off unexpectedly with my mom for the night. What mother doesn't welcome the loss of a couple wild boys for a day?? !...Then my mom called this morning to see if might be alright to keep them until tomorrow. Oh seriously, are you kidding??! Why would I give a second thought to that pair maybe wearing dirty underwear?! Of course they can stay. This happened all on the cusp of my husband (who took the day off too - he's got vacation days to burn...seems he stopped accruing them months ago and needs to burn down the balance. What a fate! That doesn't happen to a work-at-home mom!). Anyhow, he was on his way out with my daughter, taking her skiing for the afternoon. Joy...5 straight, uninterrupted hours of sewing. I was getting a quilt UPS today that needs to be done next, so I didn't have another client quilt to do all day. You know what that means. Yup, sewing just for me. My favorite. I have been muddling right along with my silk top. Until today, that is. Go figure. Whenever I have too much time to sew, I always find a way to mess that up. I had it all together up to the dark brown octagon, and was starting to make the triangle pieces. They were supposed to be a pieced/scrappy look from 3 tan and gold fabrics. 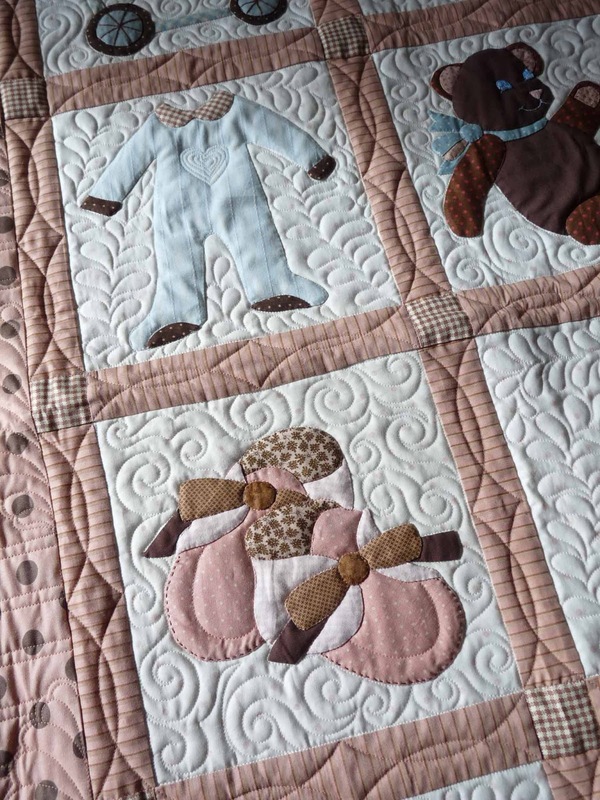 I stitched a bunch of these together to discover how very much I hated the scrappy look and the tan fabrics with the quilt. Wouldn't you know!... So, initially I figured I'd be ordering/purchasing more green fabric to do the triangles in green (when all else fails, think green. Green fixes everything! ), but I couldn't remember which green I had. Being frugal, I didn't want to order 2 shades of green to find out which one I had a half yard of! Then I realized I had light blue, and it seemed like I even had enough of it. When I staged the light blue next to the chartreuse smaller triangles, I was unsure that I liked it, but since I had the fabric, I was going with it anyways. Turns out, I do need a quarter yard anyhow, but I did manage to get 6 of the 8 baby blue/chartreuse triangles made. Lucky for me Lady Fingers sells quarter yards! That's easier than trekking around town looking. It is coming along, as you can see. The jury is definitely out on whether or not to interface. While the fabric still feels soft and silky, the joints are a tad thicker. I had a few that I needed to really match well, and several others that I am covering with decorative diamonds (so I can cut away the bulk from behind). The interfacing does not keep the pieces from stretching if they are bias because it is a knit interfacing. Once the blocks are made, though, it does help them to hold their shape. The thing that the interfacing does that annoys me is this. It makes it hard to press the seams without wanting to use too much iron heat. The polyester doesn't want to press down like the silk does. Small challenges. All in all, it is outside of my typically-chosen and preferred color palate, but it is growing on me. I love green and gravitate towards it and purple. I think the green will win me over, even though it has brown on it!